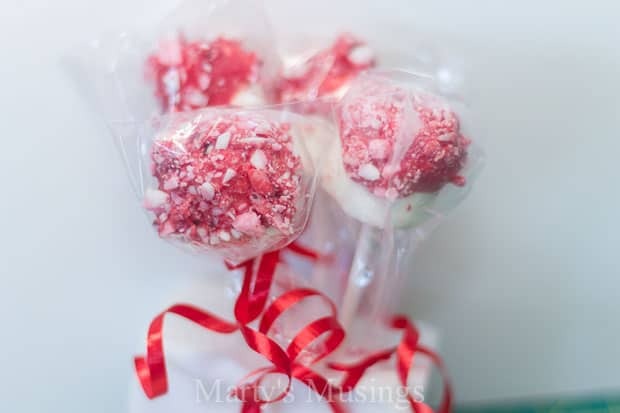 I love finding new goodies to make for this most special day of the year and Valentine Marshmallow Pops are my new favorite! Ever since my daughter’s wedding I have enjoyed making these for our Christmas parties and other festive occasions. Besides tasting great, these little bits of marshmallow goodness are also a fun addition to a holiday table. (However, I may just be a little biased about this special holiday after our 25th wedding anniversary surprise and all the fun we had celebrating with beautiful decorations and our family photo booth. 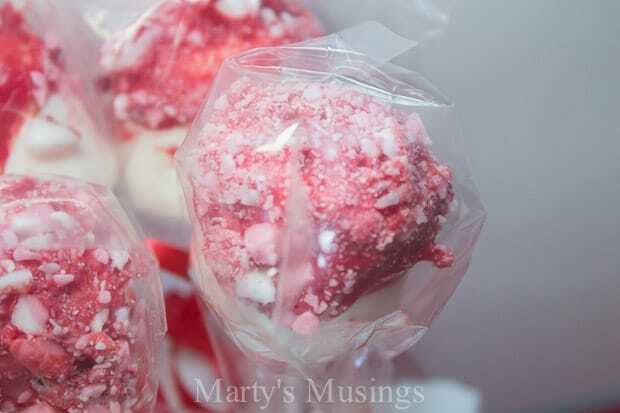 Insert lollipop stick, dip marshmallow into melted chocolate and roll in crushed peppermints. After marshmallows have set, insert into 3×4″ plastic bag and tie with ribbon. These marshmallow pops will stay fresh for a week or so. Group them in a bunch and give to your sweetheart for Valentine’s Day. You can also use styrofoam inside a glass container to make a “bouquet.” I used a sparkly Christmas ribbon and tied it around the container. 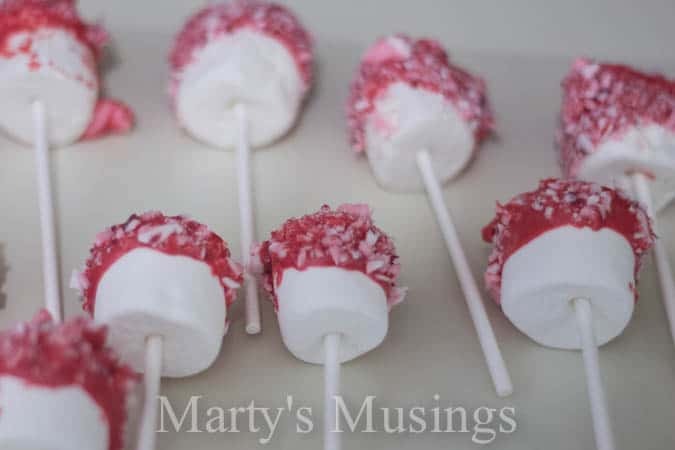 I used crushed up peppermint candies from Christmas, but you can make these pops with sprinkles, mini chocolate chips or other candies. This is a fun project to do with the kids. Give them some toppings and let them loose! Can you think of other holidays and colors you could use? 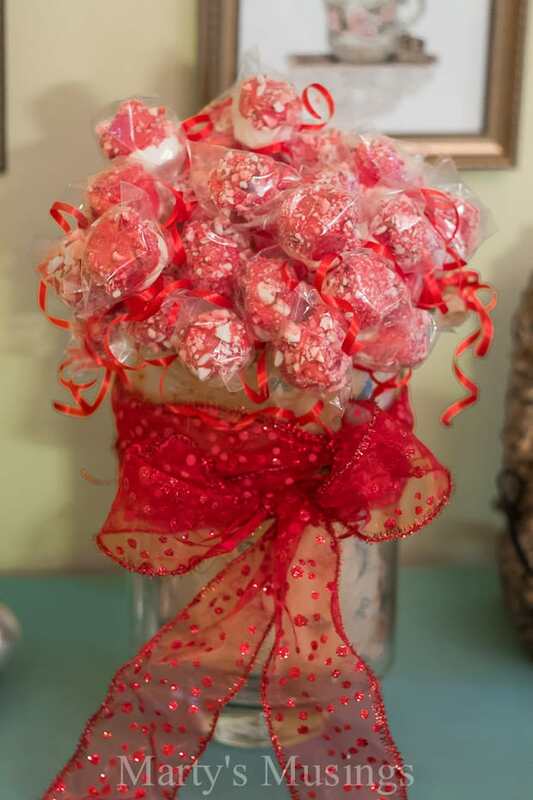 Crush peppermint candies in a separate plastic bag or glass bowl. Melt candy melts in glass measuring cup in microwave, according to package directions. Dip marshmallow into melted chocolate and roll in crushed peppermints. Stick marshmallow pop into styrofoam to harden. Wrap in plastic bag and tie with a ribbon. I didn't have any styrofoam so I just laid the pops out on waxed paper to harden. These look yummy and fun to make, too. I may need to stop by the store tomorrow for candy melts and marshmallows. Maybe it can be a Friday snow-day project! And I laughed at your mention of the blob of red chocolate. One day recently, my parents came over for dinner. My mom brought the makings for fondue for dessert, but she didn’t realize you weren’t supposed to heat the chocolate directly in the fondue pot because it gets too hot. Well, the chocolate seized, and we found ourselves with fon-doo-doo for dessert instead of fondue. (Luckily I had some chocolate chips in the pantry, and we were able to do a dessert redo.) Thanks for resurrecting that memory! Love the story, Amy! Fond-doo-doo for dessert! Bet Jackson loved that! Burnt chocolate is not pretty. No, it’s not. Nor is it tasty. We made these today and had a neighborhood hot chocolate party. They were very tasty and fun to make. Easy enough for a 6-year-old to make. And did I mention tasty? Wow! PERFECT timing! I got a couple of bags of crushed peppermint on sale and used a little on some Christmas cookies, but still had a ton left. I’m the new PTA person for my daughter’s tiny special school (19 teachers and aides), and I want to give a gift to all of them for every holiday (Thanksgiving – pumpkin pie, Christmas- cookies). I had no idea what to do for Valentine’s day, but since I’d just done cookies for Christmas (including adorable melted snowman cookies! ), I wasn’t sure what to do. This is unique and pretty. Still have to think of an inexpensive way to present them, preferably part of the gift… have any suggestions? Hey, girl! Glad you liked my marshmallow pops. How sweet of you to do all that for the staff. You can get 3×4 bags to wrap them in and tie with a bow, which is what I did. Then maybe you could just group however many you want to give each teacher and tie with a larger bow? Or you could get Valentine bags at the dollar store. That might be easier. Let me know what you end up doing. I have a large bag of peppermints in the cupboard to use up! So this is perfect and i love the idea of making a bouquet out of them. These are absolutely adorable. Thank you for sharing them at Grace at Home–I featured you! Thanks so much for stopping by and linking up your awesome project! Visit us again next week and link up more awesome stuff! 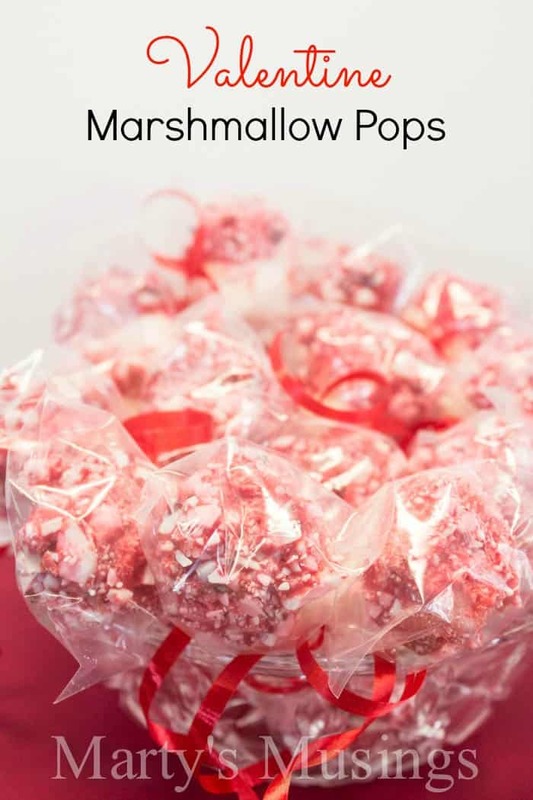 Thanks so much for pinning my Valentine Marshmallow Pops! I appreciate you hosting a party each week. Have a great weekend! This looks really good. Would love for you to link it up to the blog hop I just started.